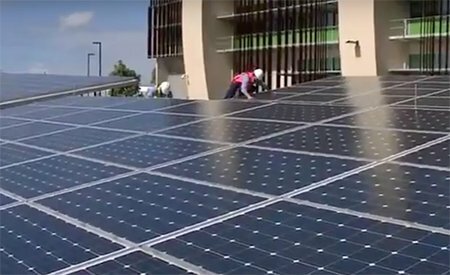 Solar power for commercial projects not only reduces ongoing energy costs, it boosts your asset value while demonstrating your environmental credentials. Sunelec’s commercial solar division has successfully designed, supplied, installed and commissioned solar power modules, mounting systems, inverters and energy monitors across a range of iconic government, council and private sector projects. Our projects have ranged in scope from boutique installations through to some of the largest projects in Brisbane with over 1850 panels generating around 610,400kWh of clean energy each year. Whether your project is on-roof or free-field, Sunelec has a reputation for delivering on time and on cost every time, working collaboratively with other trades to deliver positive project outcomes. Sunelec’s commercial installation team include Master Electricians as well as installers accredited through the Clean Energy Council. Our commercial installation team are Working at Heights accredited, and follow meticulous Workplace Health and Safety protocols and procedures to ensure site safety and a safe system of work on every project. We are committed to environmental responsibility and minimise waste through recycling aluminium, copper, cardboard and paper. Sunelec has built close partnerships with business principles, project managers and environmental engineers across a range of medium to large scale commercial projects.